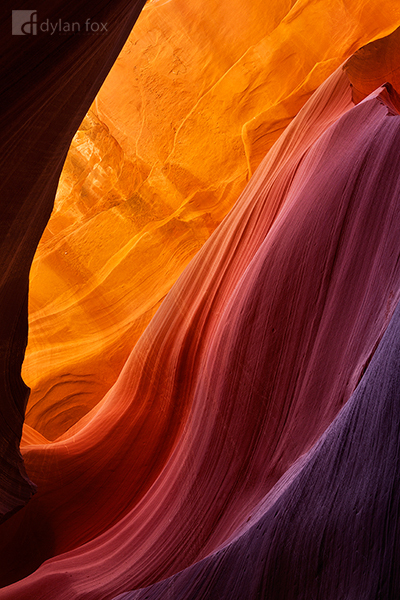 The different colours and textures of Antelope Canyon. They are noticeable to the eye however the camera is more sensitive to these differences in colour temperature. Photographing Antelope Canyon was an incredible experience and I was almost intimidated by its beauty and nervous I would fail to capture it. However I came home with a number of photographs that I love from this visit and cannot wait to one day visit more slot canyons in the south-west of the United States. Secure your limited edition, Antelope Canyon photographic print, 'Tones', by selecting your desired print size in the menu to the right.